Your ticket was canceled by yourself somehow. So you'll need to submit another one and wait for response patiently. Please do not make anything with the ticket before response. Either it will be moved to the back of the queue. @turbo07 I tried sending another ticket but it couldnt be sent for some reason. is there another way to send the ticket? 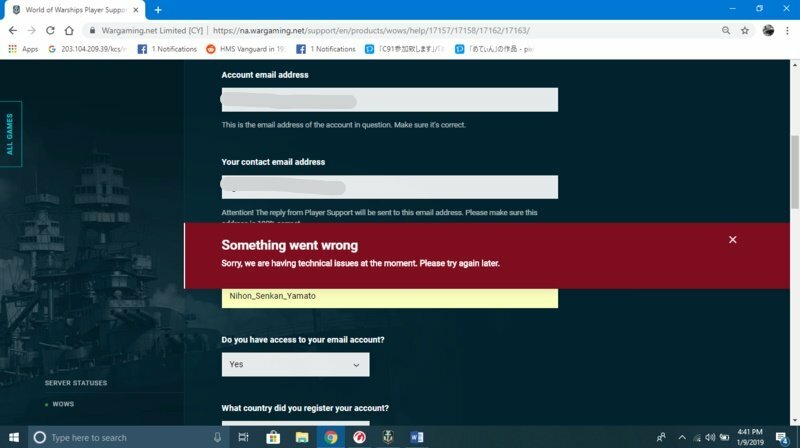 I tried sending another ticket but it couldnt be sent for some reason. is there another way to send the ticket? I see, maybe a short maintenance takes place at the moment. I look at your account. What ships are missing? Did you check all options in the filter in the port. May it be that you switched off some tiers or classes? Ok. Yes, I see, you are right about Kamikaze﻿, Kutuzov﻿, Gremyashchy, Imperator Nikolai I, Dreadnought, ARP Haruna, Giulio Ceasare, Vanguard, Haida, Belfast, Cossack, T-61, Konig Albert, Prinz Eugen, West Virginia 1941, Kii, Tashkent, Jutland, Yamato, Shimkaze. There are some Camos, Memorable flags, and Crews in hangar. Ships are missing. Please try to submit a ticket once again. And put this info in the ticket either. @turbo07 I tried to send the ticket again after you mentioned it but it still shows this Is there another way to send the ticket? We are trying to investigate the reason at the moment. We don't have any maintenance now. Do you have another email to contact? Try to change it. Another thing is to try to submit it from another browser or to clear cache & cookies. @turbo07 is there anything else that can be done? There are options how to submit tickets via our troubleshooter. Please try any other way to submit it. And we'll move your ticket to the needed support on our own. Thank you for your fast responce here. I see it. Thank you for your patience. Now it's in the queue. @turbo07 Thank you for your help, but is it possible to ask how long will it take for the ticket to be replied to? With current workload it may take approximately 1-2 days to receive the response. Sigh... 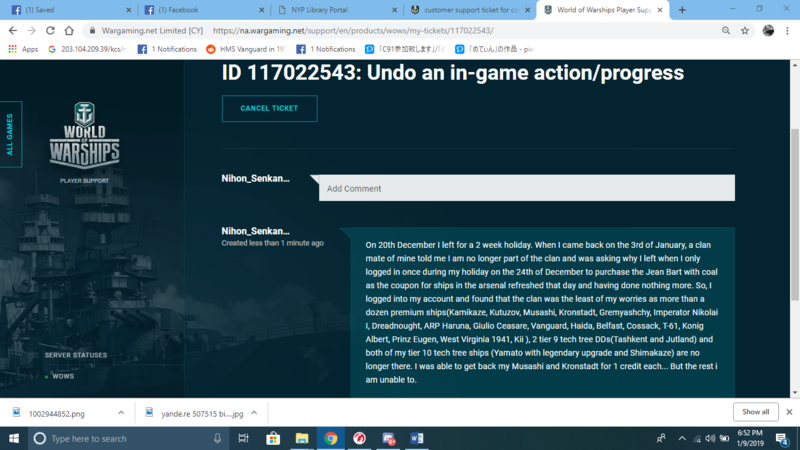 I guess I have no other choice than to continue waiting.... but @turbo07 just curious, how would the situation be handled tho when the ticket is responded to? Do I need to prepare anything for the ships to be restored to my account? Sigh... I guess I have no other choice than to continue waiting.... but﻿ @turbo07 just curious﻿, how would the situation be handled tho when the ticket is responded to? Do I need to prepare anything for the ships to be restored to my account? I have no details at the moment. My colleagues from our support need to check everything carefully. Maybe they will need some additional info from you in the ticket. The only way now is to wait for their answer. @turbo07 thank you for the assistance that you have rendered. I managed to get all my ships back. I managed to get all my ships back.